The ocean is a major influence on the world's climate and must be included in modelling to predict future climate change. But the ocean is complex, particularly the intricate biochemical processes that control the uptake of carbon dioxide (CO2) from the atmosphere. The complexity of these biochemical processes makes it difficult to accurately simulate how the ocean absorbs CO2 from the atmosphere and how it stores this carbon as global conditions change. In lieu of a deeper understanding, legacy code used in ocean models has largely represented the marine ecosystem and the biochemical processes that make up the marine ecosystem using simplified equations. In a new study published in Global Biogeochemical Cycles, a journal of the American Geophysical Union, Pearse Buchanan, a scientist at the Institute for Marine and Antarctic Studies at the University of Tasmania, and his team integrated new, dynamic ways of representing marine ecosystem processes in ocean models. In applying them, they found that a more realistic representation of the marine ecosystem helped the ocean to take up and store carbon at similar rates regardless of global changes in physical properties, like temperature, salinity and circulation. The amount of carbon stored in the ocean was half as sensitive to large physical changes as before, when using the simplistic equations. 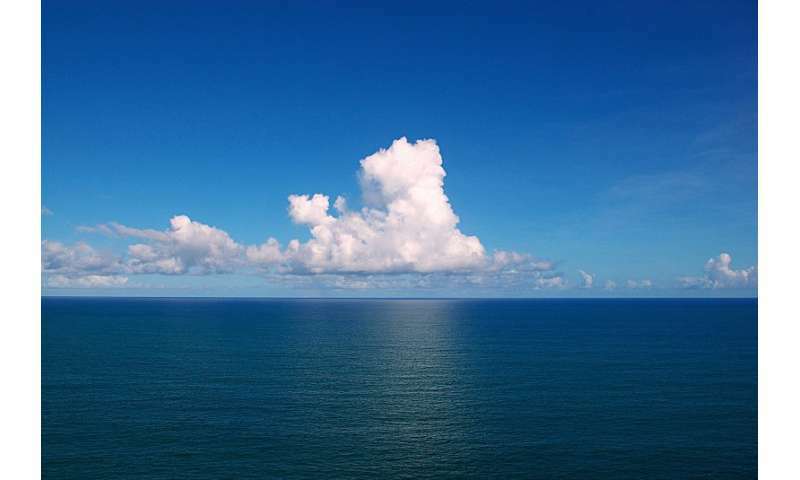 This means that an increase in temperature and the associated reorganization in ocean circulation, for instance, had less of an effect on the marine ecosystem's ability to absorb CO2 from the atmosphere and store it in the subsurface layers of the ocean. This "buffering" that biology provides suggests that important properties may be more resilient to global change than previously thought. "Due to its large volume and surface area, the biogeochemical processes in the ocean are the main control on the levels of CO2 and other greenhouse gases in the atmosphere," Buchanan said. "Marine phytoplankton absorb carbon in the same way as trees on land, and when phytoplankton die and sink into the deep ocean, the carbon they contain is locked away for thousands of years. This process is known as the biological pump. Many older models account for a very limited number of ways that the biological pump can be affected by physical and chemical properties, which may be affected by climate change. But the biological pump is actually made up of many complex processes, each with its own sensitivities to environmental conditions." "How phytoplankton communities absorb CO2 and export it into the ocean interior, and therefore how atmospheric CO2 will evolve over the coming millennia, will depend on these sensitivities, Buchanan added. "By improving how we simulate the biological pump in the ocean, we both improve the model and reveal this unexpected resilience, whereby global-scale changes to the physical properties of the ocean have a smaller effect on the biological pump. The added resilience of the biological pump allows the ocean to remain a strong sink of atmospheric CO2 despite warming and increasing upper ocean stratification." "While we did not consider pH changes, we have shown that the strength of the ocean's biological pump is probably more robust to physical changes than previously understood." Buchanan said.